At Alfi, we produce and distribute products that are the most high-performance, long-lasting, versatile, and cost-effective available. Vital products precision-crafted to perform like a charm for our customers every day, at pricing so reasonable it’s practically an afterthought. Why settle for anything less? In addition to our namesake cutlery and bakeware lines, we also supply the very best of the high-end cookware and cutlery brands for a full-service selection of products handpicked for our loyal customer base. Whether you are a home cook, baker or professional operation, our products are sure to become your favorite. Versatile kitchen knife great for slicing, cutting, dicing and spreads - these highly adaptable knives are equally at home in the garden or garage. Its high-quality serrated blade makes it ideal for a wide variety of kitchen and outdoor tasks. Perfect for slicing sandwiches, fruits, meats, fish, breads and cakes, trimming rose bushes, opening boxes and bags, you name it! Extremely sharp and long lasting, yet so affordable, it's more economical to replace this knife than to sharpen it. These multifunctional knives go everywhere and do everything! Made from hardened stainless steel, they are extremely sharp and long-lasting, yet so affordable, it’s more economical to replace them than to sharpen them. Made in a variety of eye-catching colors for easy tracking, these knives will add some flare to your kitchen and your toolbox. Introducing the most versatile knife you'll ever own! Its super-sharp blade and rounded tip is ideal for slicing fruits, vegetables, meats, cold cuts, fish, breads and cakes. 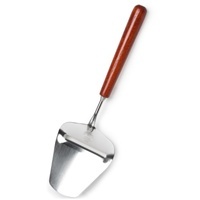 It also make the perfect workshop and gardening tool. 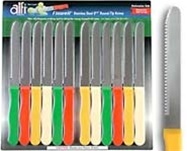 Extremely sharp and long lasting, yet so affordable, it's more economical to replace these knives than to sharpen them. This product is backed with a five (5) year limited warranty.